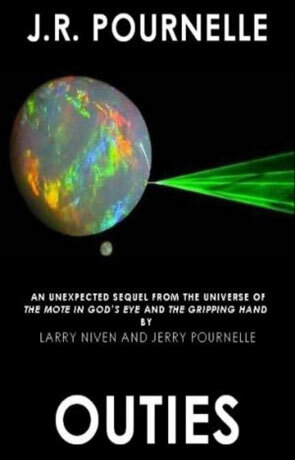 Outies is the sequel to the much acclaimed novel The Mote in God's Eye by Larry Niven and Jerry Pournelle. This novel has been written by Jerry Pournelle's daughter, Jennifer. It has been a very long time since I read The Mote in God's Eye, the review on this site was written by my predecessor TC. I do still recall the general plot and that the book did feature very well described aliens, and by that I do mean alien aliens, not some star trek-esq humans with a few ridges on the forehead. I also recall that I very much enjoyed the novel and when time permits I fully intend re-read it. Outies has been written by Jerry Pournelle's daughter Jennifer, an archaeologist, anthropologist, a decorated ex Army intelligence officer and arms control negotiator. I am a big fan of both Larry Niven and Jerry Pournelle and was both stoked and a little humbled to have been asked to review this book. The term "Outies" refers to the human civilizations that are not yet a part of the Empire, although if you have read The Mote in God's Eye or The Gripping Hand (a direct sequel) then you will be aware of this fact. Should you read the other books first? in my opinion yes, not only as this book will make more sense (and it will) but also as they are just incredibly good works of fiction. Robert Heinlein himself commented that The Mote in God's Eye was "the classic first contact novel". The novel has a bit of a slow start as plot lines and characters are introduced and while this is handled very well it does rely on exposition to move the story along in the early chapters. Once this has all been established the pace does really pickup and rockets along for the remainder of the journey. The author has an effective way of describing the thoughts and feelings of humans, aliens and animals alike that helps the reader to create that all important bond (my favourite has to be Agamemnon). As a result the characterization is very strongly developed and effective. We get deeper insights into existing characters while the author manages to make her own voice heard with the new characters that form part of the story. It should be noted that being able to write effectively about existing characters created by another author and even then build on said characters takes a great deal of ability. The story itself does a very good job of following the continuity of the previous novels while at the same time managing to expand on the canon already set, with a well developed and thought provoking plot that is both engaging and enjoyable. I also like the way recent technological trends are explored, like touch screen devices taken one step further and current theories of planetary global warming. There are a number of different threads running through the book but the transitions are handled very well, at no point did I feel lost of disorientated. Her prose is both articulate and intelligent with a very impressive knowledge of ecology, sociology and archaeology that has enabled her to create a living, breathing society in New Utah. Outies is everything a sequel to an acclaimed novel should be, paying homage to the original story without any plagiarism and managing to project a distinct voice, developing the story in a creative and dauntless fashion, recommended. Written on 15th February 2011 by Ant.